San Pedro /sænˈpiːdroʊ/ is a community within the city of Los Angeles, California. Formerly a separate city, it consolidated with Los Angeles in 1909. The Port of Los Angeles, a major international seaport, is partially located within San Pedro. The district has grown from being dominated by the fishing industry to become primarily a working class community within the city of Los Angeles. San Pedro is mainly pronounced as “San Pee-dro” by locals. The site, at the southern end of the Palos Verdes Peninsula, on the west side of San Pedro Bay, was used by Spanish ships starting in the 1540s. The peninsula, including all of San Pedro, was the homeland of the Tongva-Gabrieleño Native American people for thousands of years. In other areas of the Los Angeles Basin archeological sites date back 8,000–15,000 years. The Tongva believe they have been here since the beginning of time. Once called the "lords of the ocean", due to their mastery of oceangoing canoes (Ti'ats), many Tongva villages covered the coastline. Their first contact with Europeans in 1542 with Juan Rodríguez Cabrillo, the Portuguese explorer who also was the first to write of them. Chowigna and Suangna were two Tongva settlements of many in the peninsula area, which was also a departure point for their rancherias on the Channel Islands. Legend has it that the Native Americans blessed the land of Palos Verdes, making it the most beautiful place on Earth. The Tongva called the San Pedro area "Chaaw". San Pedro was declared 2017 Neighborhood of the year by Curbed Los Angeles. San Pedro was named for St. Peter of Alexandria, a fourth-century bishop in Alexandria, Egypt. His feast day is November 24 on the local ecclesiastical calendar of Spain, the day on which Juan Rodríguez Cabrillo discovered the bay in 1542 which would be known as San Pedro. Santa Catalina Island, named after Catherine of Alexandria, was claimed for the Spanish Empire the next day, on her feast day, November 25. In 1602–1603, Sebastián Vizcaíno (1548–1624) officially surveyed and mapped the California coastline, including San Pedro Bay, for New Spain. The anglicized pronunciation, popularized by the English-speaking people of Midwestern America, is "san-PEE-dro". European settlement began in 1769 as part of an effort to populate California, although trade restrictions encouraged more smuggling than regular business. Rancho San Pedro is the site of the first Spanish land grant in Alta California, New Spain. The land was granted in 1784 by King Carlos III to Juan Jose Dominguez, a retired Spanish soldier who came to California with the Gaspar de Portolà expedition. When New Spain won its independence from the Spanish Empire and Alta California became part of Mexico, the trade restrictions were lifted, and the town flourished. Under United States control after 1848, when the United States defeated Mexico in the Mexican-American war, the harbor was greatly improved and expanded under the guidance of Phineas Banning and John Gately Downey, the seventh governor of California after the Free Harbor Fight. In 1868 Banning created the Los Angeles & San Pedro Railroad, Southern California's first railroad and used it to transport goods from San Pedro Bay to Los Angeles which soon became a major city in Southern California. San Pedro was a township in the 1860 census. The township consisted of the present-day South Bay communities, Compton and western Long Beach. Census records report a population of 359 in 1860. The township was renamed Wilmington Township for 1870. 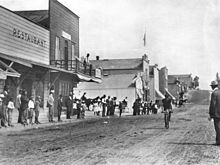 In 1906, the city of Los Angeles annexed the Harbor Gateway, a long, narrow strip of land connecting the city to the northern border of Wilmington, and in 1909, the larger city consolidated with Wilmington and with San Pedro. In 1929, the city experienced the Sunken City Disaster, where an earthquake caused multiple homes to slide off a cliff into the sea. In 1888, the War Department took control of a tract of land next to the bay and added to it in 1897 and 1910. This became Fort MacArthur in 1914 and was a coastal defense site for many years. Woodrow Wilson transferred 200 United States Navy ships from the Atlantic to the Pacific in 1919 when tension arose between the United States and Japan over the fate of China. San Diego Bay was considered too shallow for the largest ships, so the battleships anchored in San Pedro Bay on August 9, 1919. Local availability of fuel oil minimized transportation costs, and consistently good weather allowed frequent gunnery exercises off the nearby Channel Islands of California. The heavy cruisers of the Scouting Force were transferred from the Atlantic to San Pedro in response to the 1931 Japanese invasion of Manchuria. By 1934, 14 battleships, two aircraft carriers, 14 cruisers, and 16 support ships were based at San Pedro. On April 1, 1940, the Pacific Fleet battleships sailed to Hawaii for annual fleet exercises. The battleships remained in the Hawaiian Islands to deter Japanese aggression until the attack on Pearl Harbor. The fleet post office, supply depot, fuel depot, degaussing range, ECM repair facility, and naval training schools for small craft, fire fighters, merchant ship communications, and anti-submarine attack remained at San Pedro through World War II; but the battle fleet never returned. San Pedro was selected as the final home port of the battleship USS Iowa (BB-61). The Iowa now serves as a museum ship and memorial recognizing "the positive contributions of this battleship and its crew at critical moments in American history". San Pedro is located at 33°44′N 118°18′W﻿ / ﻿33.733°N 118.300°W﻿ / 33.733; -118.300 (33.74, −118.29). The neighborhood fronts on the Pacific Ocean to the south and is bounded inland by Harbor City and Torrance on the north, Wilmington and Long Beach on the east and Rancho Palos Verdes and Lomita on the west. San Pedro, Wilmington, and Terminal Island are the locations of the Port of Los Angeles. One San Pedro landmark is the Vincent Thomas Bridge, a 1,500-foot (457 m)-long suspension bridge linking San Pedro with Terminal Island and named after California Assemblyman Vincent Thomas. (It is the fourth longest suspension bridge in California.) Nearby is the Battleship Iowa museum and attraction, the Los Angeles Maritime Museum (the largest maritime museum in California), and the museum ship SS Lane Victory (a fully operational victory ship of World War II and National Historic Landmark). There is also the "Ports O' Call" tourist destination built in 1963 which provides shopping venues, waterfront eateries. "Ports O' Call" is currently under renovation by the city of LA and is expected to be done around late 2020 and early 2021. And Crafted at the Port of Los Angeles, a permanent craft marketplace housed inside the historic World War II Naval Warehouse #10. The Frank Gehry–designed Cabrillo Marine Aquarium had its origins in the old Cabrillo Beach Marine Museum which was located in the historic Bath House at Cabrillo Beach. The Point Fermin Lighthouse, a Victorian-era structure built in the late 19th century, is a museum and park on a bluff overlooking the ocean. The Korean Bell of Friendship is a massive bronze memorial bell donated by South Korea in 1976 to the people of Los Angeles. The church of Mary Star of the Sea is a prominent landmark with a steeple-top statue overlooking the harbor. On July 19, 2003, the San Pedro Waterfront Red Car Line was opened, along the waterfront between downtown San Pedro and the Cruise Ship Terminal. The line includes two trolleys built to resemble the wood-bodied 500 class cars introduced in 1905 for the Pacific Electric Railway, which once operated more than 1,000 miles (1,600 km) of track running streetcars and interurbans in Southern California. The 1.5-mile (2.4 km) line operates along former Pacific Electric right-of-way. The line, rebuilt and maintained by the Port of Los Angeles, also has one original restored Pacific Electric interurban, which is used only for special charter excursions and special events. The original car is in fact Pacific Electric 963 (former Los Angeles Pacific 713 as built in 1907) rebuilt by Richard Fellows and renumbered 1058. Discussions have been held to extend the line to the Cabrillo Marine Aquarium. On 28th Street, between Gaffey Street and Peck Avenue, is a steep section of public roadway. For about 50 feet (15 m), the street climbs at a 33.3% angle, although the rest of the street is less steep.. Pacific Coast Highway (known as PCH) runs along the coast of San Pedro, where there are great viewing points of Catalina Island. Annual "Shakespeare by the Sea, Los Angeles" Festival, held at Point Fermin Park each summer. Monthly "First Thursday" Celebration, held on South 6th and 7th Street on the first Thursday of every month. The annual Grunion Run's held at Cabrillo Beach during the summer months. Ethnically diverse San Pedro was a magnet for European immigrants from various countries for years, reflected in the number of restaurants representing diverse cuisines, especially Croatian, Portuguese, Mexican, Italian, Irish and Greek. San Pedro is home to the largest Italian-American community in Southern California, centered on the "Via Italia" (South Cabrillo Avenue). Estimates state that the community numbers about 45,000 Italian-Americans. San Pedro is also considered the heart of the Croatian and Norwegian communities in Los Angeles. The Croatian community, originally composed of seafarers and fishermen from the Dalmatia (especially the islands of Brač, Hvar, Vis and Korčula) region, has been present in San Pedro since the settlement began more than 200 years ago. The City of Los Angeles even named a stretch of 9th Street "Croatian Place" in honor of the city's old Croatian community. The Norwegian presence can be felt at the Norwegian Seamen's Church. A large portion of San Pedro is also composed of Mexican-Americans, Hispanic immigrants and African-Americans with long-time roots in the community. Much of their populations are based in the older, east side of the community surrounding the downtown area and bordering the Port of Los Angeles. Until February 1942, San Pedro was home to a vibrant Japanese immigrant community of about 3,000 people who lived in what had been described as a "typical Japanese Fishing Village" on Terminal Island (East San Pedro).These Japanese immigrants pioneered albacore fishing out of San Pedro Bay and harvesting abalone off of White Point, thus leading the way in establishing a viable fishing industry in San Pedro. The 48-hour forced expulsion of these San Pedro residents and the razing of their homes and shops, as part of the Japanese-American internment during World War II, is described in Jeanne Wakatsuki Houston's memoir Farewell to Manzanar. A total of 80,065 people lived in San Pedro's 12.06 square miles, according to the 2000 U.S. census—averaging 6,640 people per square mile, near Los Angeles' total population density rate. The median age was 34 in the San Pedro neighborhood, considered average for Los Angeles. San Pedro is considered highly diverse ethnically, with a diversity index of 63.0. In 2000 whites made up 44.2% of the population, Latinos were at 40.8%, blacks at 6.1%, Asians at 4.8% and others at 4.1%. Mexico and Italy were the most common places of birth for the 24.5% of the residents who were born abroad, considered a low percentage of foreign-born when compared with the city as a whole. The $57,508 median household income in 2008 dollars was average for the city and county. Renters occupied 56.1% of the housing units, and homeowners occupied the rest. In 2000 there were 3,394 families headed by single parents, or 17.5%, a rate that was average for the county and the city. In the same year there were 6,559 military veterans, or 11% of the population, considered high when compared to the city and county as a whole. The United States Postal Service operates the San Pedro Post Office at 839 South Beacon Street and the Eastview Post Office at 28649 South Western Avenue. The USPS also operates the Seafarers Post Office at Suite A at 93 Berth in close proximity to the San Pedro Post Office. The Federal Bureau of Prisons operates the Federal Correctional Institution, Terminal Island on Terminal Island and in San Pedro. Just 23.8% of San Pedro residents aged 25 or older had completed a four-year degree in 2000, about average when compared with the city and the county at large, and the percentage of those residents with more than a high school diploma was high for the county. San Pedro is served by the Los Angeles Unified School District. The area is within Board District 7. As of 2012, Dr. Richard Vladovic represents the district. San Pedro High School, Mary Star of the Sea High School, and the Port of Los Angeles High School are the primary high schools within the region. San Pedro High School is home to the protected landmarks in the form of The English Language Arts and Administration Buildings (c. 1939, 1936, resp.). The school recently celebrated its 100-year anniversary in 2003. It is home to both the Marine Science and Police Academy Magnet programs. Port of Los Angeles High School is a public charter high school, fusing a college preparatory program with elective coursework in International Business and Maritime Studies. Such studies reinforce the significant impact of California's ports on the global economy and international trade. As of 2012, test scores tended to be higher in the area's elementary schools than in its middle and high schools. Rolling Hills Estates Preparatory School—the current location opened on February 6, 2007. Los Angeles Public Library operates the San Pedro Regional Branch Library at 931 South Gaffey. This library was opened in 1983 in the presence of the late Los Angeles Mayor Tom Bradley. Random Lengths News started publishing in San Pedro in 1979 and now continues to be the last newspaper published there. It covers politics, local news, arts and culture for the seven communities that surround the San Pedro Bay. The paper has been continuously published by James Preston Allen since its inception.Random Lengths News has published continuously for nearly 35 years. The current bi-monthly format was introduced in 1985. Random Lengths News has taken on the role of local watchdog over Port expansion, city government, land use and civil rights. Random Lengths News founders intentionally mirrored San Pedro's local ties to the progressive movement of the 1930s. The San Pedro News-Pilot, long the area's daily newspaper, ceased publishing in 1998. The News-Pilot traced its history back to 1906; it was created from the merge of the San Pedro Daily News and the San Pedro Pilot. Some of the staff of the N-P were hired by the South Bay Daily Breeze; still covering San Pedro is former News-Pilot reporter Donna Littlejohn. An online community news and social network, called SanPedroNewsPilot.com, is not connected to the original newspaper of a similar name. In 2002, the Long Beach Press-Telegram launched the monthly publication San Pedro Magazine serving the San Pedro and Rancho Palos Verdes areas. San Pedro Magazine was cancelled in December 2008 after the Press-Telegram eliminated their magazine department. In January 2009, a new independently-owned monthly magazine called San Pedro Today debuted. Other papers available for subscription or purchase include the Los Angeles Times and the Long Beach Press-Telegram. The South Bay newspaper Daily Breeze covers news and events from Torrance and other South Bay cities. 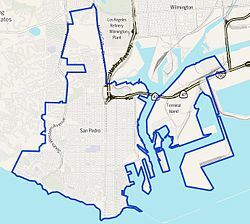 In 2003, it created a weekly, More San Pedro, in the San Pedro Harbor Area. More San Pedro was cancelled in 2008 after the Breeze was purchased and subsequently gutted by MediaNews Group. ^ "San Pedro". Geographic Names Information System. United States Geological Survey. Retrieved January 7, 2018. ^ "Pronouncing Los Angeles". www.laalmanac.com. ^ "KNX On Your Corner: 'San Pee-dro' Vs. 'San Pay-dro'". July 19, 2013. ^ "The Curbed Cup 2017 winner is... San Pedro!". ^ Lauren Lloyd (May 7, 2013). "Why Spanish Pronunciations Of L.A. Neighborhoods Are Making A Comeback". laist. Gothamist LLC. Archived from the original on June 9, 2013. Retrieved December 13, 2013. ^ Nathan Masters (January 17, 2013). "Lost Train Depots of Los Angeles". Socal Focus. KCET. ^ Stolberg, Sheryl (February 26, 1988). "No Longer the City It Once Was, San Pedro to Mark 100th Birthday". Los Angeles Times. Retrieved February 29, 2016. ^ "San Pedro's Sunken City : Portraits of LA : 2014". portraitsofla.ascjweb.com. Retrieved April 20, 2018. ^ Beigel, Harvey M. "The Battle Fleet's Home Port: 1919–1940". United States Naval Institute Proceedings Supplement March 1985, pp.54–63. ^ "Home Page - Los Angeles Museum - Battleship USS Iowa". Los Angeles Museum - Battleship USS Iowa. ^ Barragan, Bianca (March 21, 2018). "New renderings revealed for revamped San Pedro Public Market". Curbed LA. Retrieved March 10, 2019. ^ "Port of LA Waterfront Red Car Line". ^ Bob Pool (August 21, 2003). "Getting the Slant on L.A.'s Steepest Street". Los Angeles Times. Retrieved May 6, 2012. ^ "SAN PEDRO Post Office™ Location". United States Postal Service. USPS. 2012. Archived from the original on May 3, 2012. Retrieved May 6, 2012. ^ "EASTVIEW Post Office™ Location". United States Postal Service. USPS. 2012. Archived from the original on July 22, 2012. Retrieved May 6, 2012. ^ "SEAFARERS Post Office™ Location". United States Postal Service/ White Pages. USPS. 2012. Archived from the original on July 17, 2012. Retrieved May 6, 2012. ^ The Federal Bureau of Prisons (2012). "Contact The Bureau of Prisons". The Federal Bureau of Prisons. The Federal Bureau of Prisons (BOP). Retrieved May 6, 2012. ^ Master Planning and Demographic Branch – Facilities Services Division (January 2008). "Schools and Offices" (Map (PDF)). Los Angeles Unified School District – All Youth Achieving. LAUSD. Retrieved May 6, 2012. ^ Los Angeles Unified School District BOARD OF EDUCATION (2012). "Events". Los Angeles Unified School District BOARD OF EDUCATION. Los Angeles Unified School District BOARD OF EDUCATION. Retrieved May 6, 2012. ^ Mary Forgione (October 13, 2002). "San Pedro: Blue-collar soul with ocean views". Los Angeles Times – Real Estate. Retrieved May 6, 2012. ^ 15th Street Elementary School (2012). "15th Street Elementary School". 15th Street Elementary School. Los Angeles Unified School District. Retrieved May 6, 2012. ^ "Los Angeles Unified School District". Notebook.lausd.net. Retrieved March 19, 2011. ^ "Los Angeles Unified School District". Lausd.k12.ca.us. Archived from the original on June 5, 2009. Retrieved March 19, 2011. ^ a b "Los Angeles Unified School District". Notebook.lausd.net. Archived from the original on March 21, 2011. Retrieved March 19, 2011. ^ "Taper Avenue Elementary". Lausd.k12.ca.us. Retrieved March 19, 2011. ^ "Taper Technology Magnet". Lausd.k12.ca.us. Archived from the original on May 16, 2011. Retrieved March 19, 2011. ^ "You are about to leave the LAUSD network". Lausd.k12.ca.us. Retrieved March 19, 2011. ^ "Mary Star of the Sea Elementary School". Marystarelementary.com. Retrieved March 25, 2012. ^ "Christ Lutheran Church and School". www.christrpv.com. ^ "RHP History Archived March 4, 2010, at the Wayback Machine". Rolling Hills Preparatory School. Retrieved March 28, 2010. ^ "Mary Star of the Sea High School". Marystarhigh.com. Retrieved February 16, 2012. ^ "San Pedro Regional Branch Library". Los Angeles Public Library. Retrieved November 26, 2008. ^ "San Pedro Today". Sanpedrotoday.com. December 1, 2011. Retrieved February 16, 2012. Wikimedia Commons has media related to San Pedro, Los Angeles. Wikivoyage has a travel guide for San Pedro.